That was a great vantage point to take these shots. I really like how you contrast the ancient and modern. Well done! 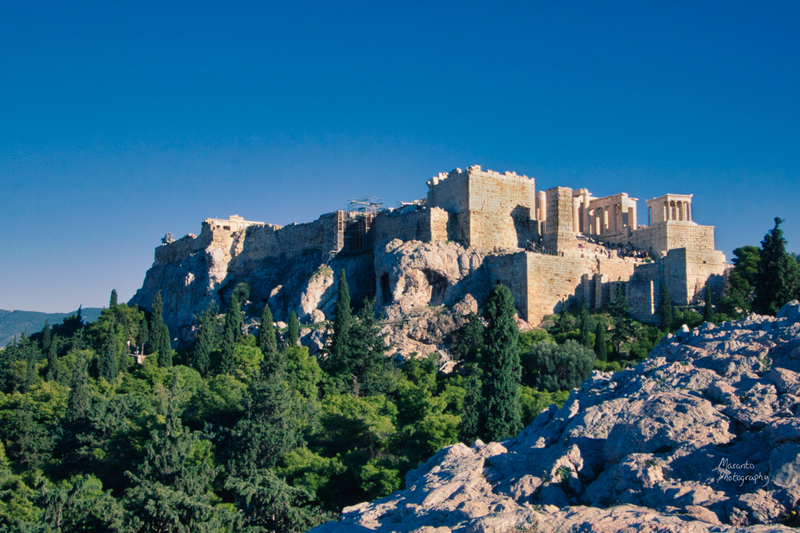 I especially love your shot of the Acropolis. I wonder how that would look in sepia? Did you ever go to Sicily? Agrigento supposedly has more Greek ruins than Athens? It was amazing. Thanks. Funny that you should mention sepia, because I gave that a quick try. I think maybe it would work in sepia if I did some other edits first. The original file is rather bright and that came through in some unappealing ways in sepia. I think it would need to be toned down first. I may give that a try at some point because I think the subject matter would be well suited for sepia. I like them both as they portray such different feelings. The colour one looks very inviting though. Thanks very much. It was a beautiful spot to sit and it was a lovely afternoon. I’m glad that made it through in the photo. Thanks for mentioning that St. Paul was there. It is a site to behold and followed the steps of him. Yes, for me it was a really interesting place to stop, have a seat, look at the view and think he had been here too. As a bit of an aside, we had also been to Malta in the past year where Paul was shipwrecked. Maybe it would seem a bit odd to some, but for me, it was really moving to be in places he had been, both from a historical perspective and a spiritual one. OMG, my last trip was at Malta and visited the church dedicated to St. Paul. Oh cool, Malta was super interesting as far as history goes. It does seem like just about everyone was there at one point. I’ve seen that view. Great idea to shoot in Black & White. It gives it such a good feel. 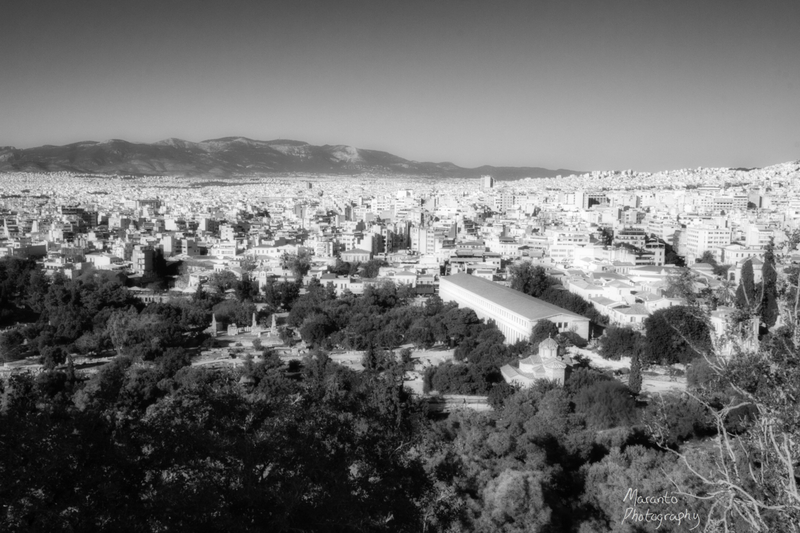 Yes, Athens offers a number of great views, but I think this was my favorite within the city itself. I’m glad you like my black and white interpretation. Thank you very much, with all the history, I couldn’t resist giving the edit a bit of a vintage feel. Both images are lovely, but I think I prefer the Acropolis. I’m trying to formulate exactly why but am having trouble. Perhaps because cities are well…cities and for me I prefer open spaces. Maybe because the Acropolis feels more like a trip to Greece should look or maybe it is the history behind it. I cannot fully articulate it, but you asked, so there have it. I understand what you mean about preferring open spaces because that would be my preference as well. Yes, the Acropolis is more what you think of when you think of a trip to Athens, so I am sure it will come as no surprise to you when I tell you that there were far more people taking photos of that view:) Athens is a great place to visit if you are into history. We are, and so were there for almost a week. We chose to visit in October to beat the blazing heat and even larger crowds of the summer. I’m not sure I could stand Athens in August. Thank you very much, we very much enjoyed our time in Athens. Agreed, it’s a great view and you’ve done well to get these shots clear of the crowd that accumulates there. I stood there as well, as did the god Ares who was supposedly tried on that hill for murdering Poseidon’s son. Yes, one of those spots where seemly everyone, man and god alike, has made a visit. It was pretty busy that particular afternoon as the weather was beautiful. The black & white works very well. I first thought it must be some old photograph. Excellent work! Ah, beautiful Athens! Looks good in B&W. Thank you, I thought that view was particularly well suited for it. Great point of view for Agora – I can relate! 🙂 .